Woody Allen no longer casts himself as the romantic lead in his films, but it’s still pretty obvious when the director’s own viewpoints, neuroses, and inclinations are coming out of his male leads’ mouths. 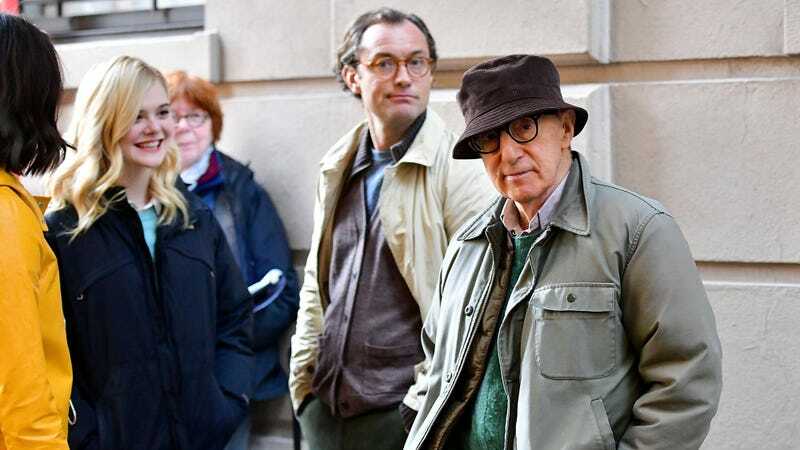 All of which is to say that a new Woody Allen movie, tentatively titled A Rainy Day In New York, is currently filming in (where else?) New York. In the wake of the Harvey Weinstein scandal, the witches at Page Six have poked around the set of Allen’s new movie with their broomsticks, and a relationship between a teenage girl (or a girl barely out of her teens, it’s not entirely clear) and a middle-aged man has fallen out. That’s right: Woody “Let’s Not Turn This Into A Witch Hunt” Allen is currently filming a movie in which a middle-aged man has a sexual relationship with a 15-year-old girl. That middle-aged man is being played by Jude Law, whose character’s profession is at this point unclear but who the film’s script reportedly describes as “mak[ing] a fool of himself over every ambitious starlet and model.” Just the other day, according to Page Six, a scene was shot where Rebecca Hall’s character confronts Law’s about his affairs with much younger actresses, asking, “Were all these women for pleasure, or were you researching a project?” She also refers to the aforementioned 15-year-old as a “concubine,” prompting Elle Fanning’s character to protest that she is actually 21, thanks. It’s not clear from Page Six’s report whether the character is actually supposed to be 15 or 21, a distinction a middle-aged (or older) man with a propensity for pursuing women half his age would argue is very, very important. We’ll leave that judgment to you, dear reader. In the meantime, a reminder that Allen’s adopted daughter, Dylan Farrow, has accused him of sexually abusing her when she was a child, describing the abuse in detail in a 2014 open letter in The New York Times. Allen denies that charge, but Dylan’s brother Ronan Farrow—who wrote the New Yorker article alleging multiple counts of sexual assault against movie mogul Harvey Weinstein—remains steadfast in his support of his sister. CORRECTION: An earlier version of this story referred to Previn as Allen’s “adopted stepdaughter”; it’s been clarified to read “Mia Farrow’s adopted daughter.” We regret the error. What&apos;s the Right Amount of Personal Space?